Traleg Kyabgon Rinpoche (Tib. སྒྲ་ལེགས་སྐྱབས་མགོན་, Wyl. sgra legs skyabs mgon) (1955-2012) was born in Nangchen, Eastern Tibet. At about the age of two, he was recognized by His Holiness the Sixteenth Karmapa as the ninth incarnation of the Traleg tulkus, and enthroned as the supreme abbot of Thrangu Monastery. The Traleg incarnation line is one of the most important Kagyü tulku lineages in Tibet and is traced back to the time of Saltong Shogom (b. twelfth century), one of the 'Three Men from Kham' who were among the five closest students to Gampopa and the only students to receive the complete transmission of both Vajrayana and Mahamudra instructions from him. Rinpoche was the spiritual director of E-Vam Institute in Melbourne, Australia; Nyima Tashi in Auckland, New Zealand; and other affiliated centers. 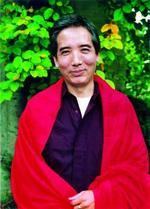 In North America, Traleg Rinpoche established the E-Vam Buddhist Institute in New York; he was its spiritual director. He died suddenly of a heart attack on 24 July 2012. His reincarnation who was born in 2013 was discovered in the Batong area of Tibet in July 2015, and recognized by His Holiness the 17th Karmapa, Ogyen Trinley Dorje and also Thrangu Monastery in Tibet. This page was last edited on 23 July 2015, at 14:16.